This one was for a card exchange, and the theme was stencils. 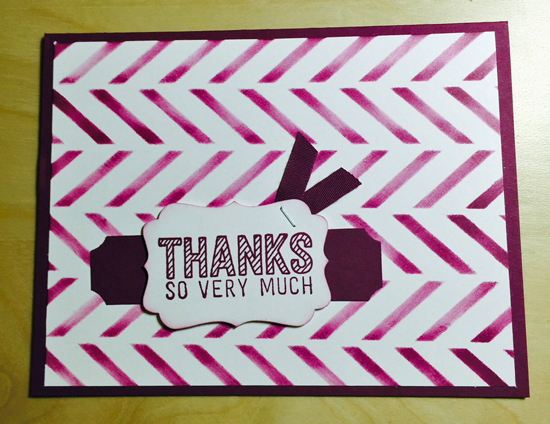 I used Blackberry Bliss on Whisper White, and the Thanks stamp from the Stampin’ Up Simply Wonderful stamp set. The stencil is Hero Arts Chevron Stencil Pair. I used a sponge to make the stencil. I punched the Thanks sentiment out with the Decorative Label Punch, and put a banner behind, with ticket-punched corners. I used a We ‘R Memory Keepers corner chomper for the ticket corners. I sponged around the edge of the sentiment and attached a little ribbon with a small staple. To make it easier to write in, I added a Whisper White layer to the inside of the card.